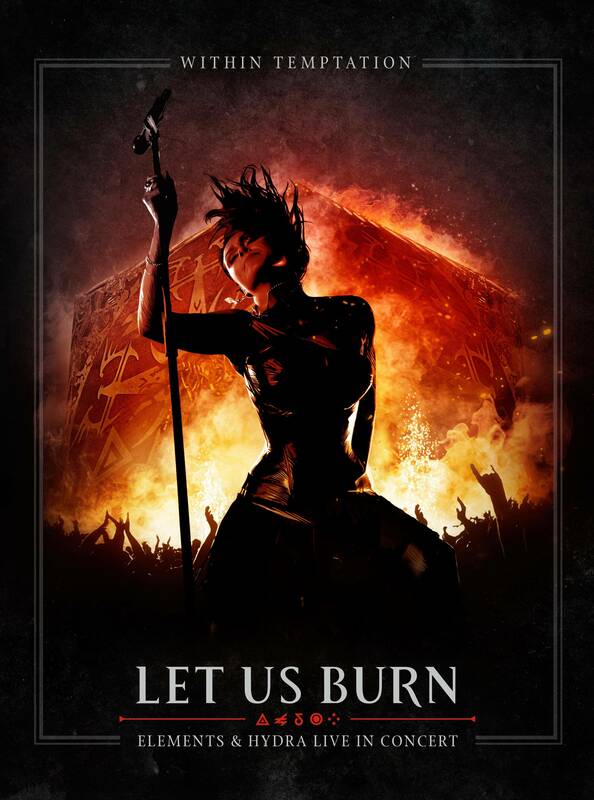 Let Us Burn is the fourth DVD release from Dutch symphonic rock/metal giants Within Temptation. The first two documented the Mother Earth and Silent Force tours, while the third – Black Symphony – was an iconic one-off event where the band performed with an orchestra. It became one of the most revered music DVDs in the genre. Now the band are back with Let Us Burn – a double whammy featuring another mega-concert (15th anniversary show Elements) and the final show of the Hydra tour. Within Temptation were initially reluctant to release Elements, stating that they were unhappy with the footage. Luckily for us, they have changed their minds and added it to this release. Unfortunately, it had already been planned to fit on one disc, and this has meant that songs have had to be cut from both sides. In some cases this is for the better, but it’s hard to see why they cut great songs like See Who I Am and The Cross in favour of giving us two versions of Faster and In The Middle of the Night. There are hints of things the band may have been unhappy with – some technical hitches and ideas that just didn’t really work out. Many fans at the time questioned the use of backing dancers (who look a bit like they forgot to get dressed) but their performances have been mostly cut or at least not focused on for the DVD. But there are a lot of visual treats as well, with spectacular staging, Sharon’s eccentric but stunning outfits and of course the orchestra and choir. It all gives the feel of something special, much as Black Symphony did in its day. And of course, the most important factor: the music. The setlist is rich and varied, and fitting for a 15th anniversary special. Although mainly comprised of hits from The Unforgiving, the rest of the band’s catalogue is well-represented, too. There are even two rare tracks – an amazing rendition of The Last Dance (bonus on The Unforgiving) and a softer one of Say My Name (b-side to Angels). The whole band are giving their all in this performance, and it really pays off. Sharon’s voice is simply beautiful, and it really is a joy to watch. By the time Elements concludes with the intensely moving Stairway to the Skies, you will feel that you’ve definitely got your money’s worth. Sadly, it’s a different story with the Hydra concert. After the grandiose Elements, it’s a bit of a let-down. If you’ve seen any of the band’s live shows on this latest tour, there aren’t really any surprises. Some of the Hydra songs don’t stand up that well amongst the previous material, especially without the epic orchestra and choir backing. Sharon’s voice sounds more tired and she gets out of breath easily, perhaps because it’s the end of a long run of shows. All this could explain why the band felt the DVD would do better with the inclusion of Elements. The first half of the show is probably the weakest, since it contains mainly the collaborations (all of the guests only appear on video) and Unforgiving songs that we’ve already seen. The second half is stronger, as they bring out some classics along with Covered by Roses and Silver Moonlight which were (personally speaking) highlights from the Hydra album. The pace is slowed by the odd choice to perform two acoustic songs just before the end, but it’s just about rescued by the massive hit Ice Queen. In summary, then, this DVD is still a must-have for any Within Temptation fan’s collection. But you may want to watch the Hydra section first so that it doesn’t feel like quite so much of a disappointment. Or if you’re not a fan of the latest album, just skip it and enjoy the epic spectacle of Elements.